Coach Tom Laws kicks the ball around with players Donte Jackson and Mark Walker. From Downingtown to Delran, this is the time of year when youth and amateur soccer tournaments spring up all over the Philadelphia region. Philadelphia will host a big soccer event of its own starting Friday afternoon. This one isn't just about the game, though. It's about a cause. In the shadow of the Art Museum, the Street Soccer USA Cup will raise money for the organization's efforts to combat homelessness. More than 900 players on 96 teams will take part. They will be spread across four mini-fields, each 52 by 72 feet, with goals four feet high and 12 feet wide. Two fields will be placed at the foot of the Art Museum steps, and two will be on Eakins Oval. Along with open tournaments for youth and adult teams, there will be a 16-team Social Change Cup with squads comprising homeless and underprivileged players. 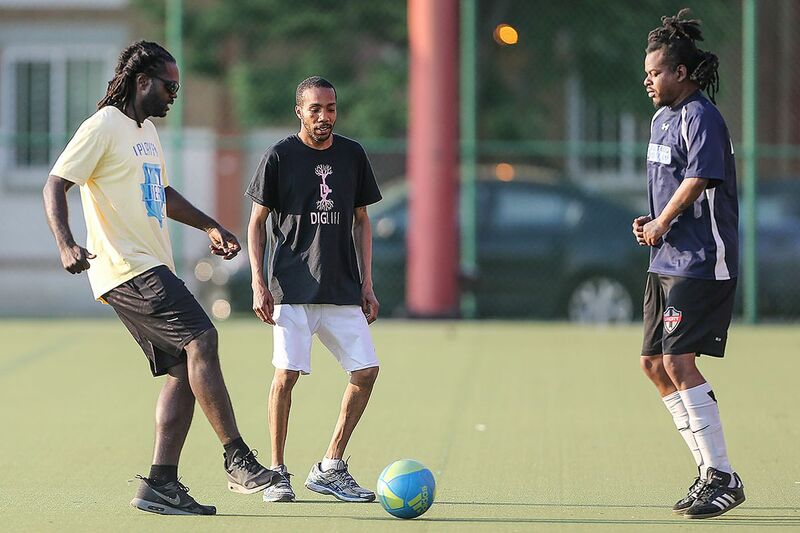 For Chandrima Chatterjee, the cofounder and program director of Street Soccer USA's Philadelphia chapter, the tournament is a chance to show that Philadelphia's homeless aren't so different from fellow citizens who see them every day. "I wanted to create a program that reached out to the underprivileged in Philly, the people that we walk past all the time in City Hall," she said. "We just kind of ignore them standing beside a highway ramp - you see the signs and you walk past them. You don't really think about it, but they're people just like us. I wanted to give them opportunity." Chatterjee was inspired to launch the local initiative after meeting John Salvucci and Evan Anderson, two fellow Penn alumni who captained the Quakers' men's soccer team in the early 2000s. They didn't know each other as undergraduates, but once they met it didn't take long to realize that they shared a vision. "Homelessness was everywhere. It's not something I was ever ashamed of" as a Penn student, Chatterjee said. "I always thought they were just our neighbors, you know? When I had the opportunity to do something, I knew I wanted to work with disenfranchised, disadvantaged people, whether it was through health outreach or sports outreach." The Philadelphia team practices at a range of venues around the city, from a community center at 10th and Wallace Streets to the fields at Penn Park in University City. Penn men's soccer coach Rudy Fuller helped set up access to the latter venue free of charge after hearing from his former players. "A lot of people said no to us at the beginning. A lot of shelters were like, 'No one's going to want to play soccer in Philadelphia. This is a basketball town. You're not going to get anybody,' " Chatterjee said. "What we realized is, all we have to do is show up week after week, and people will come. People will start to accept you. People will start to give you the chance." Chatterjee splits her time between medical research in Los Angeles and a home in Manayunk. She is a self-confessed soccer nut who follows the game anywhere and everywhere when she isn't working. "Soccer is the greatest equalizer," she said. "You don't need much. You only need a few people and a ball, and a little place to play. It's fun. It's engaging. It builds so much confidence." As passionate as Chatterjee is about soccer, she's been passionate about helping the homeless for even longer. Growing up in North Jersey, she would often travel into New York to volunteer at soup kitchens. Her first opportunity to combine those pursuits came when she traveled to Milan, Italy, in 2009 to volunteer at the Homeless World Cup. After that, she worked as an intern for Street Soccer USA and from there launched the Philadelphia chapter. "Working with the Homeless World Cup, I learned that the word [homeless] is completely meaningless, really," she said. "It's a way to put people down and limit their capacity." The Street Soccer program doesn't just teach soccer skills. It teaches life skills that get used as participants fight addiction, apply for jobs and housing, and reconnect with family. "All they really want is to be identified as something other than homeless," Chatterjee said. "To do what is within their capacity: to believe in themselves, to feel hope and pride and confidence. . . . People come to practice, and for once in their lives, they're full of potential." For more information about the program, go to www.streetsoccerusa.org.